Sometimes people make perfect plans for how their property or business will be distributed among their beneficiaries and sometimes they don’t. The death of a loved one can create family conflict, especially if the deceased left unclear instructions, wills that create conflict, or perhaps there is no will at all. Families are under a lot of stress under these circumstances, and having a well-trained neutral mediator assist in resolving outstanding issues can substantially decrease the tension and increase the likelihood that the family can overcome the tensions and enjoy a future together. As our population ages, and as adult children often assume greater responsibility for their aging relatives, the right course of action can be a source of conflict among all parties, including the elder in question. Making the best choices, handling the time and financial implications, health care proxies, and getting family members to accept or relinquish responsibility can make the “golden years” an unhappy time. These are difficult topics and beginning a more constructive approach to the conversation can be handled effectively by working with an experienced mediator. 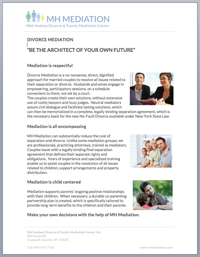 Operating as a neutral voice, without the decades of entrenched positions within families, the mediator creates an atmosphere where decisions can be reached once all sides have had their say and feel a sense of investment in achieving a positive outcome.